AKA Wilma Got Nailed & Betty Got Screwed; AKA Part 2 Of “Scratch The Hype, You Are Never Alone In Iceland”. You may wonder why I only told half the story of our first attempt to visit Askja. Those of you who understand German got the whole story from Patrick over on Journizer. And if you read his description of events then you understand full well why I waited until we were back in Stuttgart before putting this post up. Especially for those of you who know my mother. Ever since I started to travel she has decided to send me her Clairol bills claiming any sightings of gray hair as a direct result of my wandering ways. However since reforming from a backpacker to a motorcycle traveler she has declared a box no longer cuts it, but rather a trip to her favorite hairdresser is in order. This means that the bill has significantly increased, and I have responded in kind by sharing things after the fact. The denial keeps everyone happier. But the truth is reindeer did not gnaw on our helmets. In fairness nobody believed me that they did, but now I am willing to divulge the truth. Return he did, but with bad news. 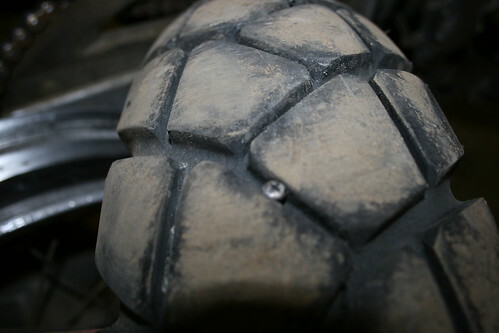 The nail had destroyed the entire inner tube. Shredded it in fact. We needed to ride 2 hours to the next big town to buy the tube there. Askja was out for the day. So I jumped on back and we took off in the direction of the ring road. When we got back to our campsite we checked the tire pressure and then headed for the “safer” ring road. I don’t actually know what happened next. I remember we were on the paved road, I remember we were approaching a hill, and I remember the bike wobbling and Patrick fighting to keep it upright. My next conscious memory is sitting in the middle of the road, Patrick behind me, trying to explain what happened. Namely that we were in Iceland (I had no memory of getting there, despite the fact we were there 4 days at that point), that his bike had a flat tire, that we were on the way to get a new inner tube, and more importantly, that we had an accident. At which point I cried out “WE HAD AN ACCIDENT?” Apparently this had in fact been going on for over half an hour, where I would get upset we had an accident, before asking him where we were, what was going on, and why we were in the middle of the road before getting upset when told we had an accident, then I would go all dazed and confused and that would be time to cue the loop. But the last time this happened is in fact the beginning of my complete memories. When told for the 30th time that we had had an accident it sunk in and I asked how, and how did we even get to Iceland, before it all came back to me, the ferry ride, Patrick’s flat tire, and then a vague recollection of the bike wobbling before nothingness. 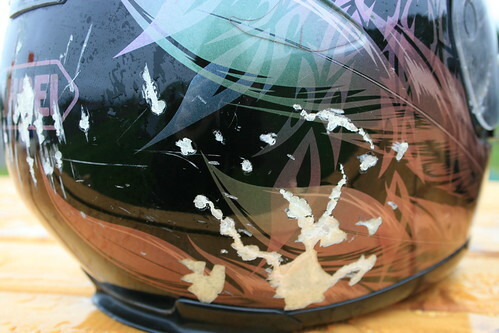 The good part was that with no memory of the accident I had no real fear of the bike. I did however have a hell of a lot of fear of not remembering anything, and a hypochondriac at the best of times I had visions of brain lesions and internal bleeding. For the curious, it takes a little over an hour for the ambulance to get you when you are outside a major center in Iceland, but still on the highway. I do not want to know what would happen if you severely hurt yourself in the middle of the interior. An hour and a half later we are in hospital in Neskaupstadur, I have a concussion but I am otherwise fine, and Patrick has severely bruised ribs but is otherwise fine. We get a 2 day stay in hospital, and may I say, if you are going to land yourself in hospital on your holidays, you could do worse than an Icelandic one! The nurses were all smiles, you get lamb for lunch and coffee and cake at 3, fruit before bed, and doctors who map out the best places to ride in Iceland! And why did Betty blow her tire on the highway despite it being brand new and the tire pressure checked before riding off? A giant screw she picked up on the ring road. And that is why Wilma got nailed and Betty got screwed. (That is a direct quote from Patrick’s facebook status, never say the boy does not have a way with words!). Hee hee, why? Apparently pretending to be goats and headbutting each other is not a universal sign of affection! I am reading your book about packing for a trip and saw this link.I ride a HD fat boy and have ridden in most of the lower 48.I am 65 love the road and everything it offers.Glad you were ok hope to one day ride to Alaska. I hope you are enjoying the packlist! And I agree, the road is one of the most amazing places to be and Alaska would be an amazing place to ride!